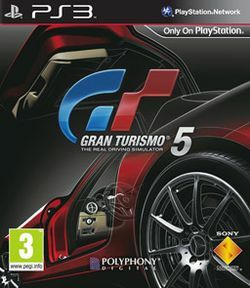 Gran Turismo 5 is a simulation racing game developed by Polyphony Digital. It is the 5th in the series. This installment adds an XP system, NASCAR, more cars, more tracks, and less grinding. It was also the first to include 16 player online multplayer. The game was a worldwide smash. This page was last edited on 30 September 2012, at 09:08. This page has been accessed 282,256 times.